Superbly located on the uber chic Via Andegari in one of Milan’s most eminent districts, the Mandarin Oriental is but a short amble away from the illustrious La Scala opera house. 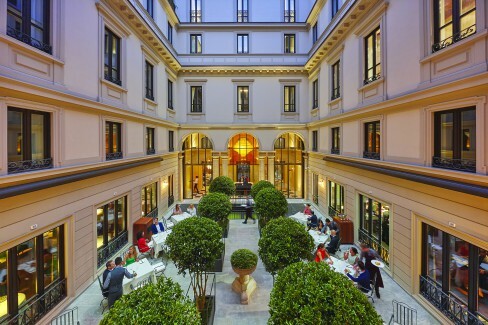 Superbly located on the uber chic Via Andegari in one of Milan’s most eminent districts, the Mandarin Oriental is housed within four original 18th century buildings. 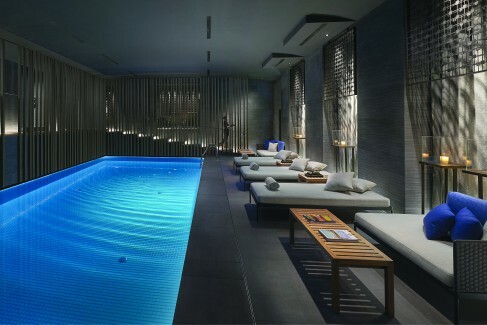 The Mandarin Oriental, Milan is situated in the centre of the city where fashion, culture and history collide. Not only is it near the Teatro alla Scala, it is also a leisurely stroll aways from the beautiful Galleria Vittorio Emanuele II and the famed Duomo. The hotel is housed within four original 18th century buildings that open out onto two parallel streets. Originally a manor house, called Palazzo Confalonieri, it later became the city’s tax office and subsequently a bank. Like other prestigious Milanese buildings of that era it had imposing inner courtyards behind a charming facade. Every room has a modern interior with individual layouts and views overlooking inner courtyards, rooftops or surrounding streets. The multi-disciplinary design studio of Antonio Citterio Patricia Viel was enlisted to re-create that classic local Milanese feel for the manor’s new avatar as a hotel. The architects’ first task was to amalgamate the four buildings with their distinguishable characteristics, yet keeping their history of ‘inner’ Milan intact. A de-linear plan was drawn up, where each room was unique and had its own individual character, just like rooms one would find in a home. Allocating colour schemes was very common in Milanese interiors during the 1930s and 40s, hence following this particular design principle of the traditional Milanese residence, Antonio Citterio and Patricia Viel employed colour as their tool to designate area functions. Italian marble complements gargantuan bay windows that frame beautiful views of the rooftops. Red, green and yellow pastel hues adorn the hotel’s lobby and lounge, while the bar has a distinctly black and white palate, and the restaurant’s green tones coordinate with the green marble jambs under the courtyard windows. The entrance area’s grey stone flooring connects the hotel not only physically but aesthetically as well to the courtyard leading to via Andegari, evoking its historic role as a cart entry. The kitschy Fornasetti Suite is stuffed with priceless original Fornasetti pieces and over the top design. 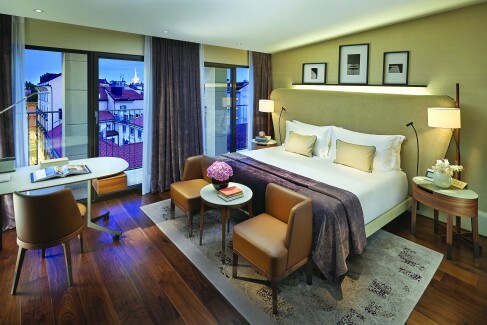 Mandarin Oriental, Milan has 70 guest rooms and 34 suites and junior suites covering five floors. Every room has a modern interior with individual layouts and views overlooking inner courtyards, rooftops and surrounding streets. Ceiling heights fluctuate from floor to floor with the highest being on the ‘noble’ lower levels where the aristocratic owners once lived. The upper stories which lodged their servants had lower ceiling heights, and to compensate this the architects put in large windows with expansive views over Milan, creating the illusion of space. 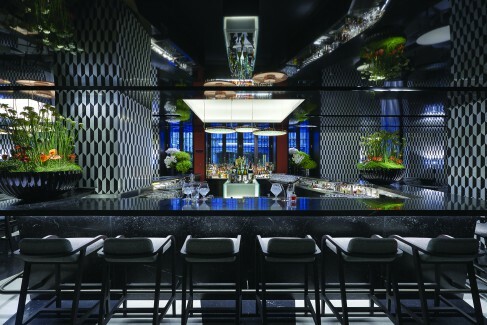 The Mandarin Bar and Bistrot is bedecked with groovy black and white mosaic that creates dazzling patterns at night in the mirrored ceiling and sleek bar counter-top. The works of Italian design masters, Piero Portaluppi, Giò Ponti and Asnago e Vender, inspired the strong Milanese ‘essence’ of the interiors – gracefulness melded with practicality, imbibing that homely feeling in every room. Beautiful oak parquet covers the floors, while walls feature oak and walnut boiseries. Every item of furniture in the hotel has been crafted by leading Italian firms with tailor-made pieces designed by Antonio Citterio himself. The warm colour palette for the soft furnishings range from shades of beige to an assortment of purples, be it on the velvet armchair coverings, the carpet and linen curtains and even the headboards. In the bathrooms, Italian marble complement gargantuan bay windows that frame jaw dropping views of the city. Antonio Citterio and Patricia Viel have employed colour as their tool to designate area functions like the red hues used in the lobby. 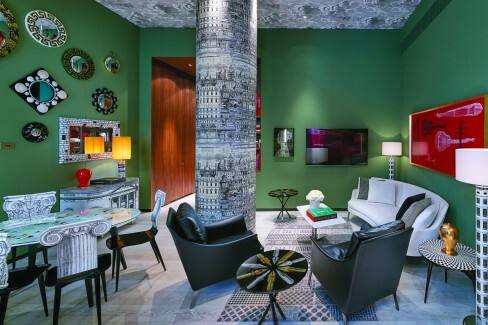 Mandarin Oriental, Milan takes pride in its two ‘speciality suites’ that pay homage to Piero Fornasetti and Giò Ponti. The kitschy Fornasetti Suite is stuffed with priceless original Fornasetti pieces and over the top design. From the pièce de résistance in the living room, a pillar covered with Riflesso (reflection) wallpaper that separates the ‘Ultime Notizie’ dining table, ’Capitello’ chairs and the ‘Fly’ coffee table, the ‘Guscio’ sofa and the ‘Boss’ black leather armchair, to the Venetian trumeau ‘Architettura’ and ‘Palladiana’ sideboard that complete the furnishings in the lounge. While green walls embellished with mirrors and motifs on the ceiling reflected in the curtains, round off this visual cacophony. Located in the hotel’s second courtyard, the hotel’s two Michelin starred restaurant, Seta offers its guests a more formal al fresco atmosphere. The hotel’s two Michelin starred restaurant, Seta presents fine dining, while the Mandarin Bar and Bistrot is the hotel’s beating heart. The vibe here changes slowly from a quiet retreat in the day time to a spirited night spot after dark. Guest can relax outdoors on loungers bathed in muted light, while indoors the walls are bedecked with groovy black and white geometric mosaic that create dazzling patterns in the mirrored ceiling and the sleek bar counter top. La Loggia, a corner of the courtyard subtly screened by columns and yet imbued in the ambience and glamour of the Mandarin Bar and Bistrot is the optimum setting for an intimate meal. The spa and wellness centre has six private treatment rooms, a Spa Suite and a special Thai massage room and awesome indoor swimming pool. While Seta, located in the hotel’s second courtyard offers its guests a more formal atmosphere as it unwraps itself indoors as well. Huge glass windows connect inner and outer spaces, while wooden floors and ceilings, carefully appointed green upholstered chairs matching the marble tones of the doors create a dignified air. Milan’s cultural flamboyance mingled with the hotel’s legendary Oriental heritage, reverberates through its exemplary service and incredible design. The Mandarin Oriental, Milan is truly ‘the’ place to be! 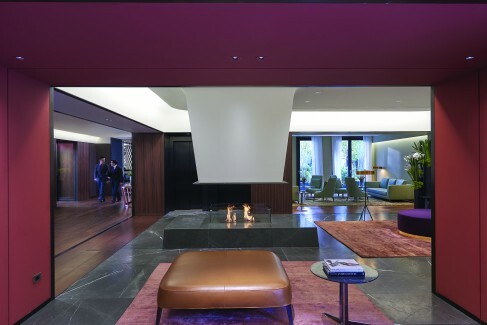 Photos courtesy Mandarin Oriental, Milan.